Opening the crisper drawer after I have been away for a week is a lot like opening a time capsule or, an Egyptian tomb – a rush of ancient air desperate to rejoin the space-time continuum. I close the drawer quickly before something else slithers out and wonder what my family ate while I was away. Then I check the recycling bin and count the pizza boxes using the fingers on both hands. I mourn briefly the tree that died so my family could avoid preparing a single meal while I was away. This one must have been sizable judging from the cardboard overflowing the bin. It was likely a sapling when Columbus stumbled (tired and hungry like I am now) into the New World, unleashing a chain of unfortunate events that inevitably led to this. But who am I trying to kid? I should know by now that filling the fridge with fresh food before I leave is pointless; my family would likely eat the cat before they considered steaming broccoli. Opening the crisper drawer again I know that it is not treasure I will find. No gold-encrusted Tutankhamen for me, just mould-encrusted Rootandlemon. I breathe deeply and insert an arm – this is where dinner is coming from tonight, no matter what; I refuse to give another hard-earned dime to Pizza Pizza. And then, like manna from heaven, a large bunch of asparagus I bought at the market the day before I left. And, miracle of miracles, it’s still good. Sure, I have to bend it almost double before it snaps, but it beats the double-pepperoni alternative. And guess what? The soup is delicious and nobody asks where it came from and I feel (just a little) like Indiana Jones. Serves 4. This soup is good hot or cold. Add butter to a large pan over medium heat, cook shallots until soft and translucent. Add asparagus, lemon juice and stock. Bring to a boil, reduce heat and simmer for about five minutes until asparagus is tender. Remove a few asparagus tips and reserve. Transfer soup to food processor or blender and puree until very smooth. You may need to do this in batches. Return to pan and add cream. Heat through until hot but not boiling. Garnish with reserved asparagus tips and chives. 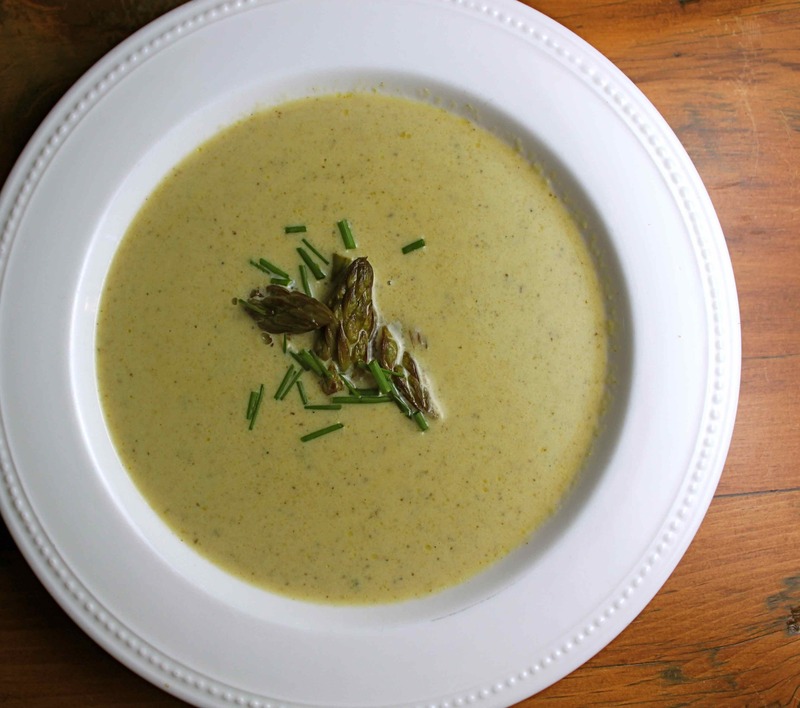 This entry was posted in Soups and Stews and tagged asparagus, butter, chicken stock, chives, cream, lemon juice, recipe, shallots. Bookmark the permalink. I save the bottom ends of the asparagus I steam, then peel them and use them in a soup just like this except if I don’t have enough asparagus bottoms, I add something like pea shoots to make up the difference. Just delicious and it means you throw out a lot less.